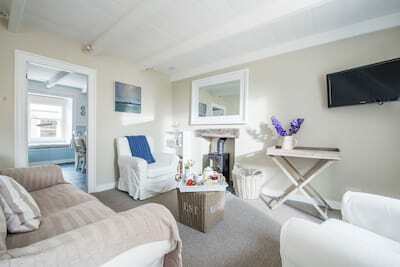 Just moments from the sea, a warm coastal welcome awaits within the hidden away haven of Ferry Cottage. Check in to chic holiday luxury and discover the charm of Marazion from your holiday door including the iconic St Michael's Mount, golden sand beaches, cool cafes and artisan craft shops and galleries. Choose from 2 boutique bedrooms and relax, unwind and reconnect within the open plan living spaces that spill out into the beautiful walled courtyard. Ferry Cottage is as perfect for small families as for couples whatever the occasion, whatever the season. Follow the characterful mews of traditional cottages on Leys Lane and arrive at the winning location of Ferry Cottage just moments from the hub of village life. Once inside, the cottage oozes coastal style with a fresh nautical palette of crisp white and marine blues, thoughtfully chosen artwork and a relaxed open plan holiday layout. The living room welcomes cosy fireside afternoons with a favourite film or offers a tranquil retreat for a morning coffee before heading out on the days itinerary. The budding chef in the party will enjoy the light and inspiring kitchen, with Cornwall firmly on the foodie map you are never far from a tempting farm shop or artisan bakers to help create the perfect holiday menu. Dine in style at the wooden dining table and slide back the glass doors for an al fresco ambiance. A contemporary cloakroom completes the ground floor plan. A white washed wooden staircase leads to the first floor and the collection of two bedrooms and family shower room. Each of the bedrooms have been dressed to impress continuing with the coastal colours and luxury twist amidst the original features. The owner has lovingly created a charming walled courtyard garden which brims with lavender and botanical potted plants, the original red brick wall offers warmth to the backdrop as you relax on the comfortable garden furniture. The coastal village of Marazion is just a hop, skip and jump from Ferry Cottage and has so much to offer. Head to the local bakery for fresh coffee and pastries, enjoy a lazy lunch on the terrace of the newly renovated Godolphin Arms or make a reservation at Ben's Kitchen for supper. Curio and craft shops ensure the perfect souvenir shopping whilst children enjoy locally made ice creams before heading to the beach. From the young to the young at heart, the iconic St Michael's Mount is well worth a visit as you wander along the granite causeway and explore the castle and gardens. Old fashioned days at the beach are an easy option with over a mile of sand and azure blue swimming waters. When the Atlantic swell rolls in, admire the hardy wind and kite surfers. Whilst in the West, take a day trip to The Isles of Scilly and ferry hop around these stunning islands. Further afield, the wild seascapes and fishing villages around the coast will certainly fill your days. 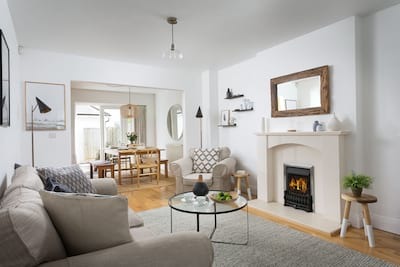 Ferry Cottage comes highly recommended to guests looking for a quintessential Cornish cottage with a bespoke luxury twist. Overall we had a lovely time and the cottage very nice and in a great location. Our dog loved it on the little beach at low tide. We would stay again. We were very impressed with the company and cottage. We had a very comfortable stay in a very stylish cottage.